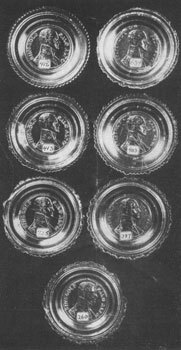 Over the years since collecting cup plates became a diverting hobby, it was natural that they should have become classified into two groups, known today as “historicals” and “conventionals.” The historicals are, for the most part, those which commemorate famous persons or historical events. “Conventionals” present an evolution of design — from the simple geometrical patterns of the early days, through the beautiful but sophisticated lacy glass patterns onward to their end in the Gothic Revival. 1. In this group of rare cup plates honoring the Mexican War hero, Major Ringgold, there are seven variations. The late Edwin Lefevre once remarked that the reason he enjoyed collecting historical flasks was that he learned so much about history; to which his friend, Kenneth Roberts, quipped that he did not have to collect bottles to learn about history which could be found by consulting the Encyclopaedia Britannica. It would appear that Mr. Lefevre had a point, because no encyclopaedia sheds light on Major Ringgold, “Rough and Ready,” though he was enough of a military hero to be commemorated in cup plates, flasks and Currier & Ives prints. In doing research on the Major Ringgold cup plates I was completely baffled until I remembered an old article in the Saturday Evening Post of October, 1929, titled, “Why I Collect Empty Bottles,” by Edwin Lefevre. The article disclosed that he, too, had had difficulty in finding Major Ringgold’s story but had finally unearthed it in a volume by Powell, titled The Life of Zachary Taylor. Space does not permit the entire quotation as written by Edwin Lefevre. Brief excerpts will suffice to cover the main events. Major Ringgold was born in Washington County, Maryland, in 1800. His mother was the daughter of Gen. John Cadwalader of Philadelphia. He was graduated from West Point with high honors in 1818 and entered the artillery as a lieutenant. He was a fine-looking man, witty, keen-minded and magnetic. Gen. Winfield Scott selected him as one of his aides. In 1836 he was engaged in the Florida campaign, and for his valuable services was breveted major. The hero died on May 11, 1846, at Point Isabel, Texas. His body later was taken to Baltimore and there buried “with grand civic and military honors” on December 22, 1846, at the age of forty-six. The cup plates commemorating Major Ringgold doubtless appeared in 1847. Any Ringgold plate is rare, some more so than others. None is beautiful in point of design, and they are usually found in poor condition (fig. 1). Probably the most eagerly sought-after cup plate among the historicals is a round plate bearing a simple bust of George Washington in the center. This plate was unknown until recent years; even at this writing only two specimens have been discovered. The only other Washington cup plate is octagonal in shape, with rays forming a background for the bust. The latter plate is a splendid addition to any collection but it is in no way so rare as the former. It seems quite likely that the Washington cup plates were brought out at the centennial of his birth – 1832. Certainly moldmakers were inspired by important events of the day in an age when horsedrawn vehicles represented speed. As a result, events such as centennial celebrations, political campaigns or progress made in industry or shipping were such important topics that they were recorded in glass, china and prints as well as in verse. Popular subjects meant larger profits in sales! Henry Clay was the subject for ten different plates, all apparently of Eastern origin and all but one bearing his name. The latter is sometimes referred to as the “No Name” Clay. There are two Henry Clay portrait busts facing to the right which are not only rarer than any of the others but also appear to be of an earlier date. It is believed these earlier plates came out in 1832 during his political campaign for the Presidency, when he was the Whig candidate opposing Andrew Jackson. 2. 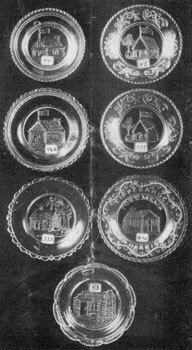 Seven varieties of log cabin cup plates, mementos of Harrison's campaign for the Presidency in 1840. The Henry Clay plates with the face to the right are the only ones in the series having stippled backgrounds. They represent finer workmanship than the later Clays. The later plates bearing his name could have been to honor a public-spirited servant of his country, particularly when he ran for the Presidency as the sole Whig candidates against Polk in 1844. The Henry Clay plates should have been popular for many years, for he was continuously in the public eye from 1803 (prior to the date of cup plate manufacture) until his death in 1852. There is no more colorful or interesting character in American history depicted in cup plates than William Henry Harrison. Born in Berkeley, Virginia in 1773, he was a lieutenant in the army at the age of eighteen and elected to Congress at twenty-six. In fact, there was not a time over a period of fifty years when his life was not highlighted with important events, culminating in his becoming the ninth President of the United States and ending in tragedy when he died thirty-one days after his inauguration, at the age of sixty-eight. William Henry Harrison is recorded in two groups of plates, one of which bears his bust while the other comprises a most interesting series of fifteen plates known to collectors as “the log cabins” (fig. 2). The two plates bearing Harrison’s bust were apparently made from the same mold. The one with plain panels above and below the bust was a Presidential campaign plate; the recut mold with “president” appearing in the plain panel above the bust and the date “1841” below, possibly commemorates his death. He was elected to office in 1840 and died so shortly thereafter, in 1841, that it is difficult to say whether this plate appeared the moment he assumed office or whether it came out during the country’s period of mourning. Both of these plates appear to be of Sandwich origin. Collectors will find the log cabin group a never ending source of interest, with some extreme rarities to spur them on. Though Harrison was a hero of the Midwest, many of the cup plates are of Eastern origin. The log cabin and hard cider barrel were Harrison campaign symbols. While the Democrats smeared Harrison as a “hard cider drinking,” war-worn-out old man, poverty stricken and mentally unfit for the office of President, the Whigs delightedly pounced on these stories and capitalized on them to their own advantage by promoting a series of campaign slogans for their candidate. To name a few of them, he was “The Farmer of North Bend,” “The Log Cabin and Hard Cider Candidate,” “Tippecanoe and Tyler too,” “Harrison and Reform,” etc. Gen. Harrison was a wealthy man but for political expedience he adopted the log cabin and hard cider barrel. Log cabins became Whig headquarters. His campaign was implemented further by Harrison log-cabin bottles marked “Tippecanoe” and “North Bend,” Harrison banners, Harrison buttons, Harrison and Tippecanoe handkerchiefs, Harrison cup plates and whiskey flasks. The log cabin cup plates marked “Fort Meigs” commemorates Harrison’s defense of Fort Meigs and the battle of the Thames, October 5, 1813, though of course they were made at a later date. The Whigs overlooked nothing in behalf of their candidate. A series of ships of various types embellish a group of cup plates but identification is difficult if not well-nigh impossible when they are unlettered. At present, unfortunately, speculation is the only basis for identification of these unmarked ships. For instance, there are two round and three octagonal plates picturing what is thought to be the U.S. Frigate Constitution, popularly called “Old Ironsides.” A frigate was an old-style war vessel in use from 1650 to about 1840. It was smaller than a ship of the line and carried from 24 to 50 guns on the main deck. Paul Jones was placed in command of our first frigate on the same day that Congress adopted the U. S. flag, June 14, 1777. It is believed plausible that the ship in the series mentioned is the Constitution, and that the storm of patriotic protest brought about by the attempt to dismantle and sell her after her colorful career inspired the occasion to commemorate the ship in glass. The round Constitutions are more rare than the octagonal forms, both styles being of Midwestern origin. The small ship which has become known as the Cadmus may be the Constitution but it definitely is not the Cadmus. There is no way to prove that it is anything older than a frigate. The Cadmus used steam and sails. It is quite likely that the name Cadmus was originally given this plate by early collectors who knew the Clews Staffordshire plate by that name and to whom a ship was merely another ship. The so-called Fulton side-wheel steamship cup plate may be found both round and octagonal in form, the round ones being extremely rare. Both appear to be of Midwestern origin. 3. 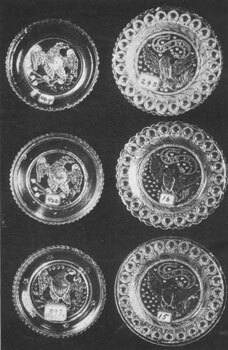 Six of the 58 varieties of cup plates that show the American eagle as motif. It seems entirely reasonable to assume that the design of these ships was inspired by Robert Fulton’s early experiments in navigation. Interest in improvements in navigation were going forward steadily, but it appears strange that the Midwest should have commemorated the Fulton in particular, since Robert Fulton died in 1815. The cup plate is of the 1835-38 period. The ship as depicted on the plate bears no resemblance to the Fulton but is a clumsy side-wheel model with heavy superstructure. It might well be an Ohio or Mississippi River steamboat, possibly intended further to popularize travel by water. The efforts of all researchers would be greatly facilitated if the old-time glassworkers had marked the ship plates, as was done in the case of the Benjamin Franklin and the Chancellor Livingston. The completion and dedication of the Bunker Hill Monument, June 17, 1843, brought about no less than twelve cup plates showing the monument. The dedication ceremony was a momentous occasion in Boston; the exercises took place in the presence of the President of the United States and his cabinet, besides many other persons of importance. Daniel Webster was the orator. This series of “Bunker Hill Monument” plates appears to be of Sandwich origin; they are commonly found today except for those in color. Undoubtedly they were sold as souvenirs before and after the completion of the monument. A story was circulated at one time to the effect that the monument was financed by sale of the Bunker Hill cup plates but this seems too dubious for serious consideration. The largest single decorative figure shown on any group of cup plates is the eagle (fig. 3). There are some 58 plates displaying the bird and nearly all of them are variations of the design on the United States seal. The figure of the eagle, as king of birds, is commonly used as an heraldic emblem. France used one under the Bonapartes. The eagle also has appeared on many of our coins, the first being on the copper cent issued before the adoption of the United States Constitution by the various states during the period of the Confederacy. It is not surprising, therefore, that enterprising moldmakers utilized the eagle as a standard patriotic symbol and found it a best seller over a long period of years in the cup plate era. The cup plates discussed cover a large portion of the historicals. The only foreign person portrayed on a known American plate is Queen Victoria of England. There are several “Victorias with Henry Clay border.” This writer believes all other Victorias, as well as the Jenny Lind plate, are of English origin. Cup plates in color are scarce. Suffice to say that they are in the minority and therefore sell for higher prices than their counterparts in clear glass. I have inherited 4 cup plates — Henry Clay, George Washington, Benjamin Franklin and one that says “THE WEDDING DAY AND THREE WEEKS AFTER.” Included with the items is an article from American Home, 1975 that says they can be purchased for $40. What are these worth today? I have an amber colored Tippecanoe Fort Meigs, W. H. Harrison plate that is 8 inches in diameter. I have not been able to find an example anywhere. All I can find are the smaller cup plates. Any idea if this is from the same time period or a replica? Value? “ ” An Ugly Club member would be an object of ridicule on the streets, but a superstar within the sanctum of the club.